This year, I’ve decided to change my fall decor to incorporate the coastal decor that I have throughout my home. Rather than bringing in the deep fall colors, I’m using lots of neutrals, some shades of green and blue and some coral. My goal is to have a coastal autumn theme. 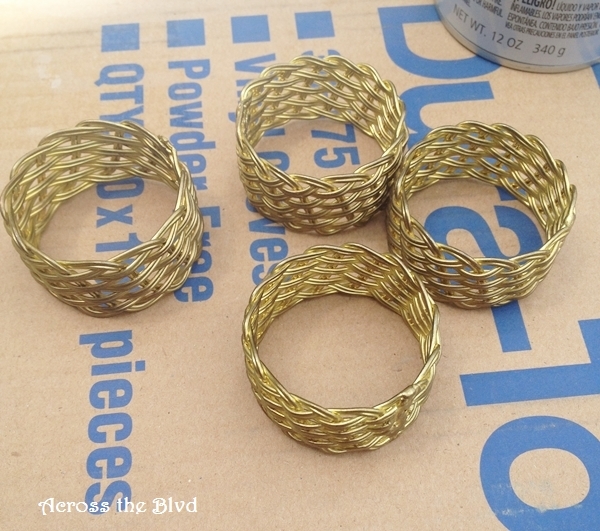 Making these napkin rings for my breakfast nook was my first fall project to fit this color scheme. 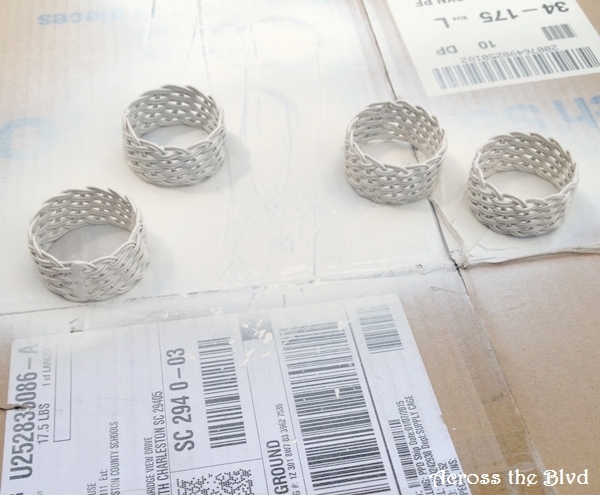 I started with a set of four metal napkin rings. These were old ones that I haven’t used in years, so they were perfect for this and zero dollars is better than any dollars I would have spent on new rings. I want these to be long lasting and sturdy. If I wanted them for a more short term use, I could have used paper towel holders cut to size. I didn’t want the gold tone to show, so I used Valspar Riviera Dune Flat Spray Paint on these. I gave them two coats to make sure I covered all the gold. I used a metal rod to hold the rings while I was spray painting the second coat to make sure I got the outside edges covered. It was hanging between two low tree branches. Sometimes you have to improvise or in this case I didn’t want to pull out the saw horses for such a small project! 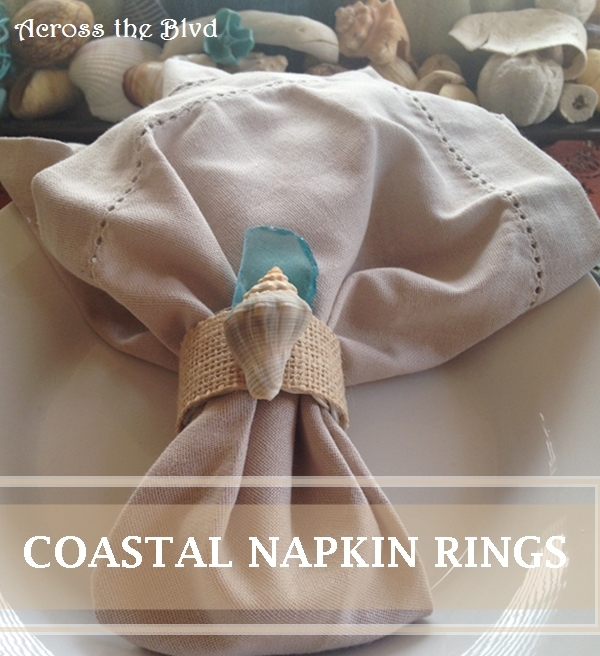 Once they were completely dry, I was ready to turn them into coastal napkin rings. 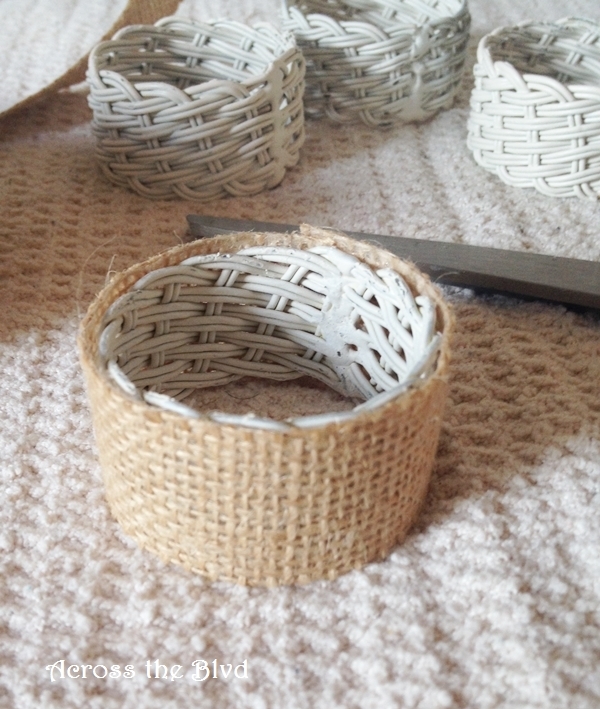 A few weeks ago, I found a roll of burlap adhesive tape. This was new to me, so I grabbed a roll of it not knowing what kind of use I might have for it. 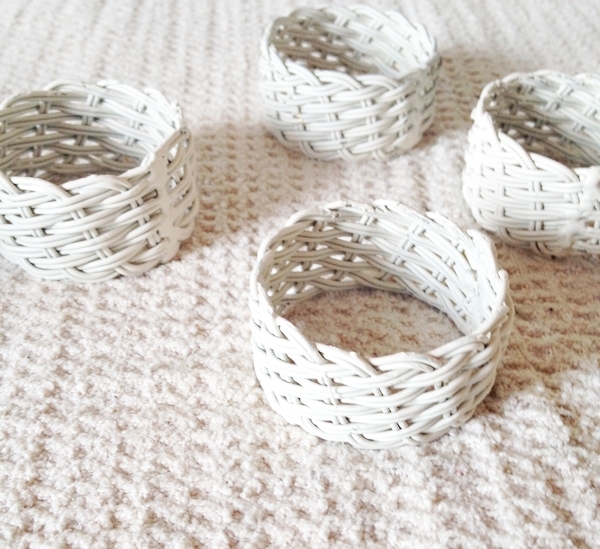 It was just the right width for these napkin rings. 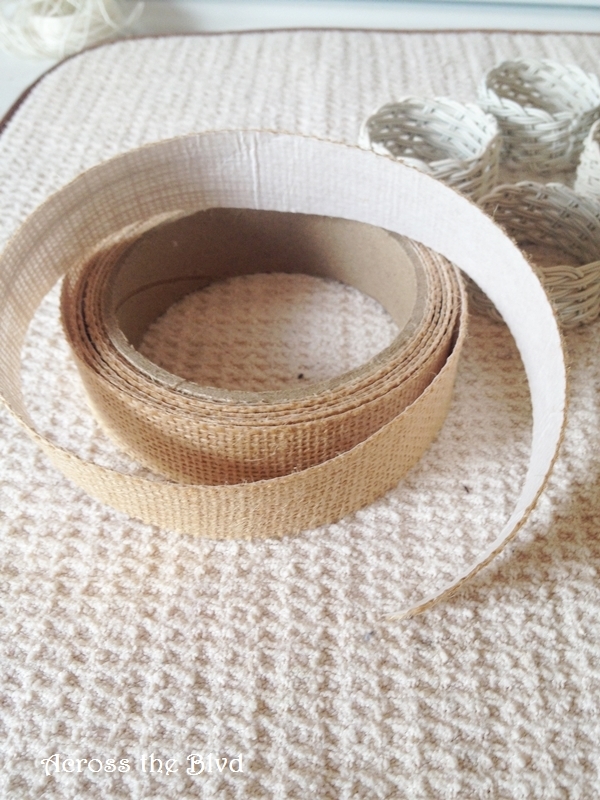 I liked that by using this tape, I didn’t have to deal with fraying burlap. I will tell you though, that the adhesive is not particularly strong. I decided to add a tiny drop of hot glue where the ends met just to make sure it didn’t come apart. 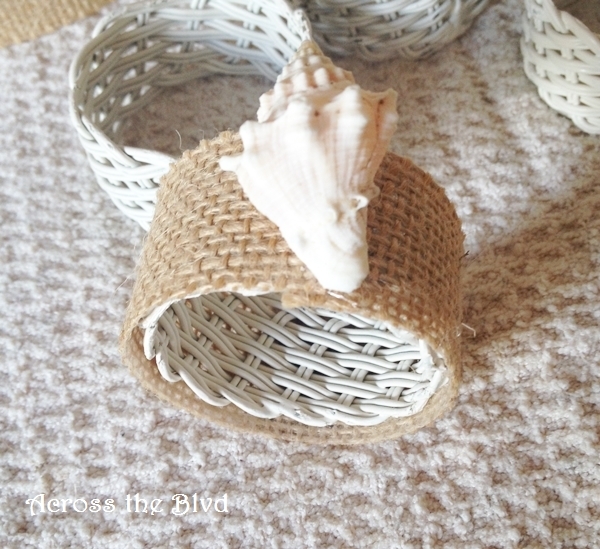 To add the coastal touch I wanted, I used a very small seashell and hot glued it onto the burlap. I glued it onto the seam of the burlap to cover the overlap. While I liked the way these turned out, I thought they looked a little too plain. 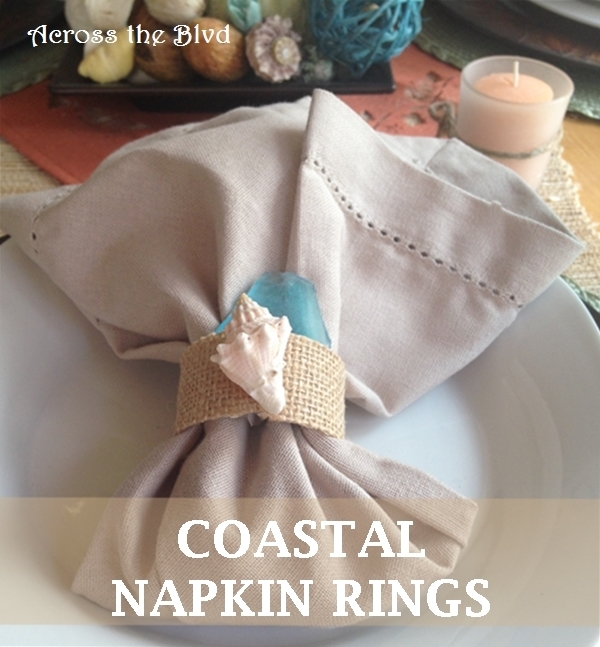 I’m using neutral napkins for this table and the napkin rings didn’t have the pop I wanted. I wanted to add some color that would match the centerpiece I’m using on the table. Sea glass was the perfect addition. 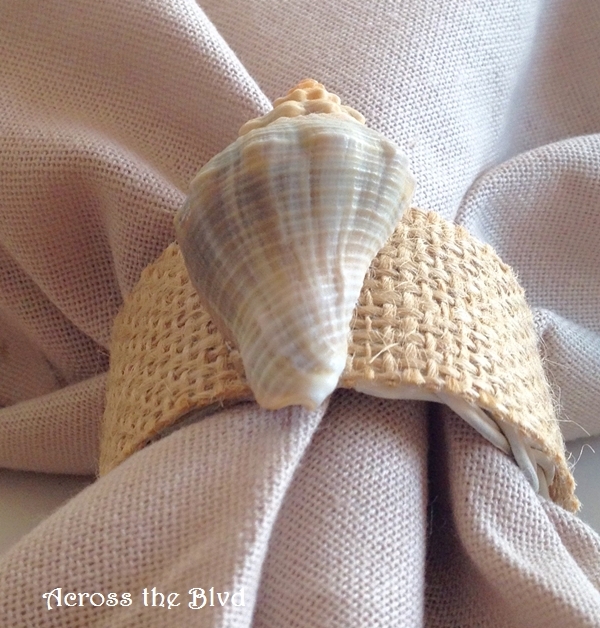 I used a tiny bit of hot glue and secured a piece of sea glass to the inside of the napkin ring. That gave me just the look I was going for. Making these was easy and very budget friendly. I’m happy with how they turned out and they fit perfectly with my Coastal Autumn decor. I can’t wait to put the finishing touches on my breakfast nook table. I’ll be sharing more of how I’m blending coastal and autumn decor in my next few posts. Do you use traditional fall colors or do you experiment with new color palettes? I’m hoping I can pull off this look so that guests will think fall and the coast all at the same time. We’ll see what happens! Beverly, these are lovely! I agree that the sea glass adds just the right amount of color! I’m interested in seeing the rest of your posts on your coastal autumn decor using non-traditional colors! 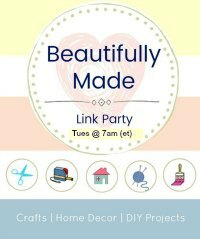 It’s awesome that you re-made something that you no longer use, my favorite kind of project! 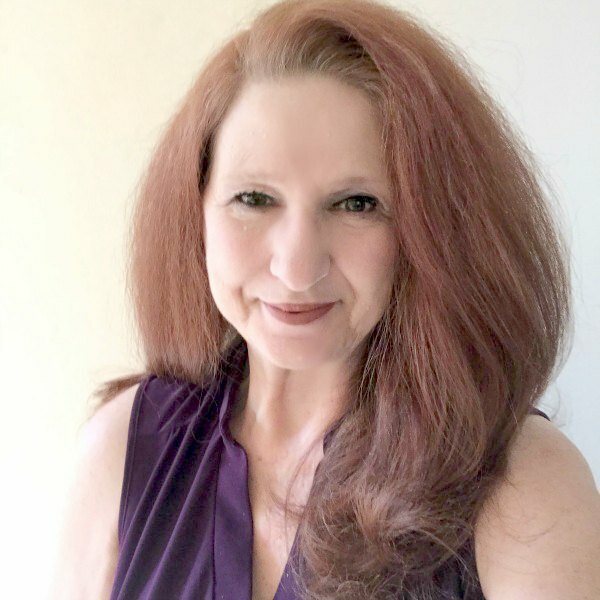 Thank you, Laurie! It’s a work in progress, but so far I’m happy with how it’s coming together. Reworking old items is favorite of mine, too. Hope you have a great Labor Day Weekend. You know I just love this idea!! 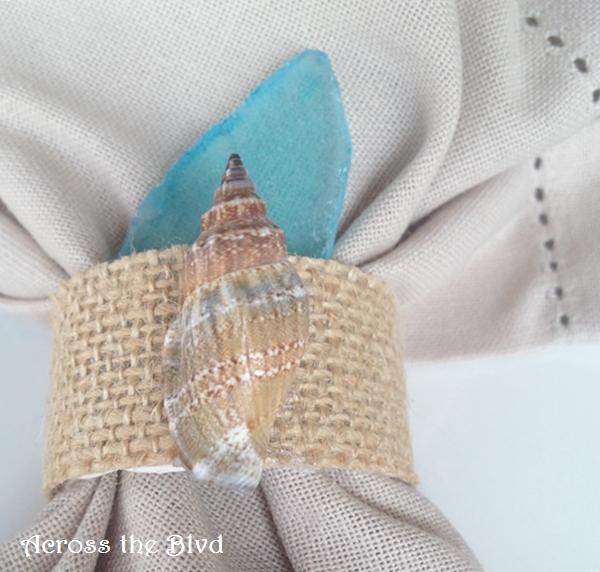 Sea glass, burlap, and repurposed napkin rings????? Yes, indeed. Pinning this to my pinterest board, and I will definitely be on the lookout for the burlap tape. I am dreaming up coastal fall ideas, too. I’m thinking soft grey-blue pumpkins mixed with white pumpkins, and some burlap for texture. Can’t wait to see what your autumn coastal tablescape looks like, Beverly. Those items all go together so well, don’t they? I’m having fun with trying something new for the fall. I’m also enjoying not having to put my coastal items away for the season. I found the tape at Walmart, but I imagine craft stores have it, too. Your color scheme sounds pretty for fall. I’m using lots of blues and greens along with some white, too. I’ve found a few new pieces, but I’m painting a lot of my old items and giving them this new look. Happy Fall to you, too! What a cute idea and may I ask where did you find the burlap tape?? How cook is that!! Thank you, Debbie. I found it at Walmart. It’s made by Creative Essentials, the company that also makes laminated burlap sheets that I use in my printer. Glad you like the napkin rings. Thanks for visiting! What a cool idea, and they turned out so well! 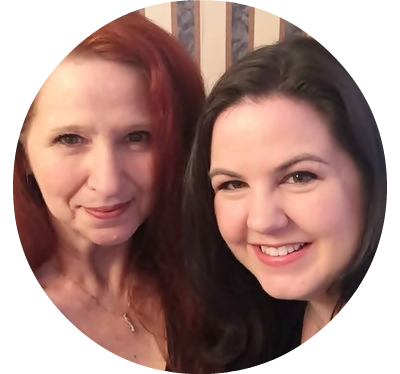 Thanks you for sharing this with us at Merry Monday! Thank you, Megan. I’m always happy to share on Merry Monday. These are so pretty, I love the pop of color from the sea glass. Thanks for sharing at What’d You Do This Weekend?! Thank you, Joy. And thank you for visiting. Thank you. I’ll be sure to stop by.